This fall, President Donald Trump is hoping NAFTA renegotiations will bring millions of factory jobs back to the U.S. His insistence that he could recreate a dubious golden age of employment in America was, if not the reason he came to power, a cornerstone of his campaign. But for all the focus Trump has put on these issues, he’s been oddly silent on one of the greatest plights of working-class Americans: Most blue-collar jobs that still exist in this nation are increasingly bad jobs. The same would be true of the type of jobs Trump has sworn to bring back to the U.S. Many Americans working in manufacturing, service, and manual labor can no longer rely on their employers to provide reasonable compensation, benefits, or working conditions, and are instead stuck with grueling and unpredictable hours, low pay, and even safety hazards. 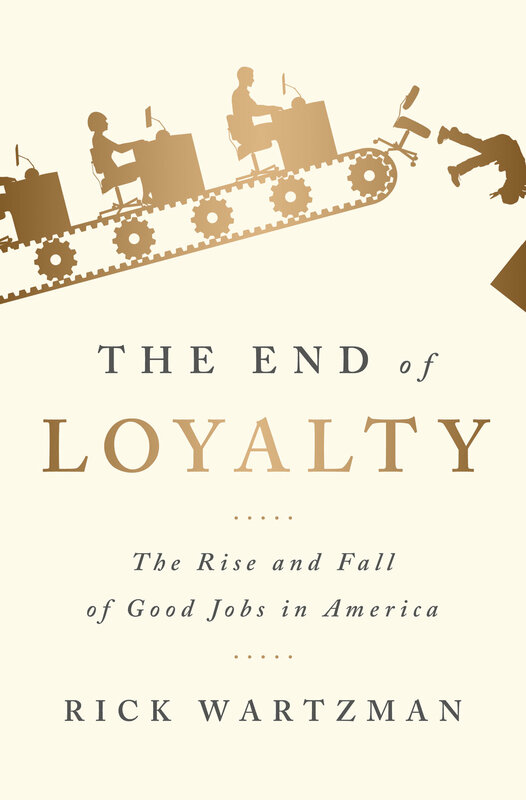 In his new book, The End of Loyalty: The Rise and Fall of Good Jobs in America, longtime business editor and founding director of the Drucker Institute Rick Wartzman zeroes in on the roots of this dilemma. Through four corporate case studies, Wartzman shows how a social compact emerged in the mid-20th century, creating a national and corporate culture focused on the good of workers and communities. The generous benefits and salaries of this era afforded men with limited skills a reliable path to prosperity. From the 1970s on, though, those forces eroded rapidly among public companies as a focus on shareholder profits led executives to scale back benefits and wages, downsize staff, and lobby the government to curtail unions and workers’ rights. The compact of the post-war era had all but vanished by the 1980s. Wartzman’s takeaways from this history are not heartening. That mid-century compact, he argues, may be gone forever. The fractured labor market of today makes it increasingly hard for workers to push for new benefits and iron-clad rights. How exactly Americans concerned with the lack of good jobs can create an uplifting labor-corporate balance today feels unclear. So Make Change recently caught up with Wartzman to talk about that, among other things. Make Change: Was the culture that encouraged companies to create good jobs in America in the mid-20th century always fated to fade away? Why couldn’t we hold onto that longer? In the book, I talked to Dan Yankelovich, this great pollster and cultural observer, about some of this. His analysis was, during the ’30s and ’40s, there was this ‘we’ ethic. But as America prospered and that next generation came around there was a sort of backlash to it. His thing was that the ’60s —[which I thought was a ‘we’ era, with] communes and hippies and Woodstock—he said, ‘No, what was really a big piece of that was individualism.’ Greed is Good in the ’80s and ’90s is, in his view, not that different from Do Your Own Thing. It’s the grown-up, cynical version of it in some view. You can see mass movements [today] where maybe people are starting to realize we need to pull more in a ‘we’ direction again. People are coming at it from very different ends, whether it’s the far right or whether you’re a Bernie bro. But there is a ‘we’ element to both of those. Can we break out of this trajectory favoring stockholders and short-term profits over laborers, without undergoing some massive shock to our economic and cultural systems? How far can the current line of corporate culture go before we hit a tipping point? Rick Wartzman. Photo by John Huggins. I hope we don’t have to come to another Great Depression. That would be awful. The Trump election is a wake-up call. He, whatever you think of his politics, managed to tap into the anger and anxiety people feel. For [some areas], it does probably feel like an economic depression. I don’t want to compare it to the ’30s, which were desperately worse. But if you’re in a community where a lot of people … had decent jobs, and they and their families have been displaced, that feels pretty terrible. So if we’re not at that crisis point, we’re maybe at the edge of it. There are still huge, powerful forces that will keep corporate executives from beginning to treat their people better. But I think there is a growing recognition among corporate leaders that, unless prosperity is shared more equally, capitalism may be on an unsustainable path. Fortune magazine last year took major companies’ CEOs to the Vatican to talk about this very issue: How do we share prosperity more broadly, and what’s corporate America’s role in doing that? Was some of it PR? Absolutely. Did they fix the problem? Of course not. But the fact that there could be a convening [like that], I can’t imagine something like that happening in the ’80s or ’90s. They would have been laughed at. So I think there is a growing awakening among a number of corporate leaders that [addressing economic inequality] is in their self-interest. There was a Harvard poll last year of young people that showed that more than half don’t believe in capitalism. If I were a Fortune 500 CEO and I read that, that would scare the hell out of me. There’s also a growing interest in socially responsible investing. A lot of that is focused on the environmental side, but there are growing tools and interests in that on a people side. Pressure may be growing on companies to show they care about employees’ well-being. But it’s easy for them to make token adjustments that look good but do little in reality—unless there’s a strong sense of the new benefits we want to see. So do we have a clear sense of what companies need to provide workers today? There are some standards out there. There’s some notion of what a living wage looks like, for example. Every worker gets that, even if they’re [outsourced] labor … or independent contractors or whatever. It does get trickier on the retirement security front. And sure, it gets trickier by industry. Some margins are very different and the kind of labor they employ is very different and so on. But [the old compact] was about how corporate profit pies were being divided up. That is a good place to look and a good standard: see who’s investing in their workforce and who’s not. If you had to push for one policy change to even out the worker-employer dynamic in the near future—one thing that we should advocate for hard—what would it be? They’re all important. And it’s complicated, [but] if I had to point to one thing, it would be to invest more in education and training and to do it more systematically in the public and private arena. That could be encouraged in all kinds of ways—both carrots and sticks. That’s not going to lift people quickly. But we’ve moved on from a world where you could go to a factory and it was hard work, but you could have no education and you could find a path to the middle class. We’re in a knowledge age. Yet we have half the adult population in this country with no post-secondary education at all. No four-year degree, no two-year degree, no technical certificate: Those are the people, by and large, who are being left behind. So if I were president, my moonshot would be to revamp this whole thing top to bottom to create a system of lifelong learning. That’s not a quick fix. That’s not a cheap fix. But is there anything we can do that would be more important, fundamentally, than that? You point out in your book that it’s harder for unions to push for policies like this, or to speak for workers in general, under restrictive state laws and in a more fractured labor landscape. Do we need new types of labor advocates? What would they look like? [Labor leader] David Rolf made this really interesting point: When Trump enacts the Muslim ban, people know where to send money. But when Trump is, despite his rhetoric, assaulting the working class by rolling back regulations meant to protect workers, where do you send money? There’s no central place. That pointed out a big hole. There needs to be some thinking about that. There are new forces. There are groups that are taking advantage of technology … figuring out how to organize workers. But this is not collective bargaining, right? It’s giving people a voice. That’s important. But it certainly doesn’t carry the force and weight collective bargaining did. It’s possible something like collective bargaining is an outmoded system. … Unions worked pretty well when you had large masses of workers in a factory complex and you could organize thousands at a time. But now the laws have become so weak and employers have gotten so good at beating back organizing drives, it’s really hard to organize. The whole thing needs to be rethought. We’ve been talking about new tactics to guarantee benefits for American workers. But people obviously like Trump’s easy, nostalgic rhetoric—the idea that we can just restore the old system. What do you say to them? Unfortunately for those people, that will quickly take care of itself when massive numbers of manufacturing and coal jobs don’t come back, which they’re not going to. Politicians who engage in the same rhetorical tactics will always find support. But [the fact] that this is complicated … fixing these things isn’t easy and takes huge investments, will become more apparent because it’s true. It’s not a guy riding in on a white horse who saves everything.